Last semester Spiritual Development led you down the narrow road. 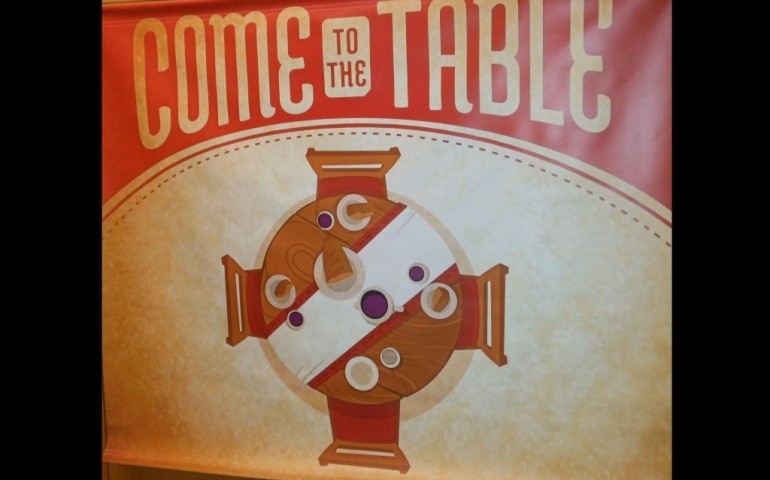 This semester as chapel kicks off on Thursday, August 27th, you are invited to come to the table. Blair Spindle, University Pastor and Dean of the Chapel was inspired by Leonard Sweet’s book From Tablet to Table: Where Community Is Found and Identity Is Formed as well as his mission trips to Mexico when coming up with this semester’s chapel theme. Both Spindle and Banning Dawson, Pastor of Worship and Chapel, are looking to expand the number of students they have over to their homes for fellowship and time at the table. In the past a small number of students have been selected to become a part of a small group and walk in discipleship with Spindle. In keeping with this semester’s theme, a larger variety of people will be invited to share in this intimate time. In addition to new banners in chapel, students will also notice the chapel stage will display a farm style table. This table will not just be a static prop or stage dressing. This table will be used to connect with both chapel attendees and guest speakers. Some speakers, prior to giving their message, will be asked to sit at the table and tell the audience more about themselves. While this semester’s theme will be made known to all guest speakers, they will still have the freedom to choose the topic of their message. Blair does not want to limit the speakers, but he hopes that they will be able to connect with the theme and deliver their own take on it. Chapel attendees will also see an increase in the number of opportunities that communion will be offered. Spiritual Development looks to satisfy the longing of students who wish to participate more frequently in the sacrament.